To Purchase ART prints please visit Fine Art America. Fine Art Ameirca Profiles Richard Herron. Design interpretation of a Talbot Lago and other marques. See Design section at left. 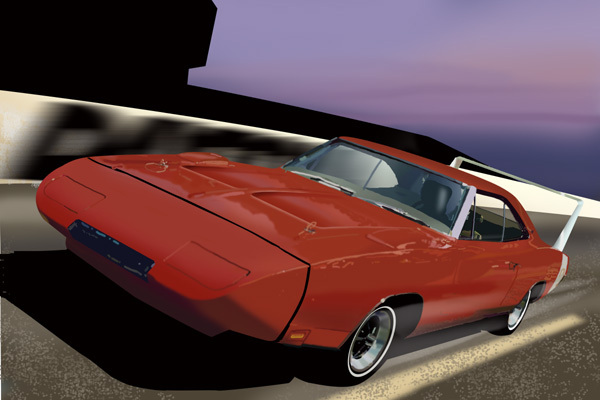 Classic Auto Renderings and Rick Herron are not associated with any of the manufacturers, shown or named; implied or otherwise. The original GT 40 was one of the most revolutionary race cars in history. One of the first mid engine race cars, it's design set the trend for future mid engine cars. It used a monocoque design and a new system of construction where molding and bonding were used as in the aircraft industy. It exceeded 200 mph down the Mulsanne straight at Le Mans and versions of it won there four times. The one pictured above is the late model recreation. The Dodge Daytona was one of the most potent and aerodynamic cars in the stock car circuit during its day. The history of stock car and NASCAR goes back to the late forties and fifties when moonshine runners hopped up their cars to outrace the law. It took many decades of rule changes to get to the cars we see today. Stock meant that it was a car from the factory and not a racecar in the traditional sense built from the ground up. Small modifications were made but basically it was a car that most anybody could own. The Audi R8 is built on the same chassis as the Gallardo but with a different body style that is more Teutonic than Italian. Images of a VW campervan, graciously donated so that I can use them as the basis for campervan artwork. The actual images show the vehicle as it is, for sale. To purchases this wonderful example please contact the owner at victoria.weston@appostingemail.com. Keep posted for updates of the artwork. Concept Car design services see "Designs" section at left. Automotive Fine Art Art that combines the American Passion, the Automobile, with the scenic beauty or historic heritage of our great country by one of America's recognized automotive artists. SHELBY GT-350™, SHELBY GT-500™, SHELBY COBRA “Daytona” COUPE™, SHELBY COBRA 289 ™ and COBRA 427 S/C are registered trademarks owned by Carroll Shelby and Carroll Shelby Licensing, Inc.
"Auburn ®" and "Cord ®" are registered trademarks of Auburn Cord Duesenberg Co. Automotive art, car art, muscle car art, auto art, whatever you may call it, this Fine Art site is dedicated to AUTOMOTIVE ART. 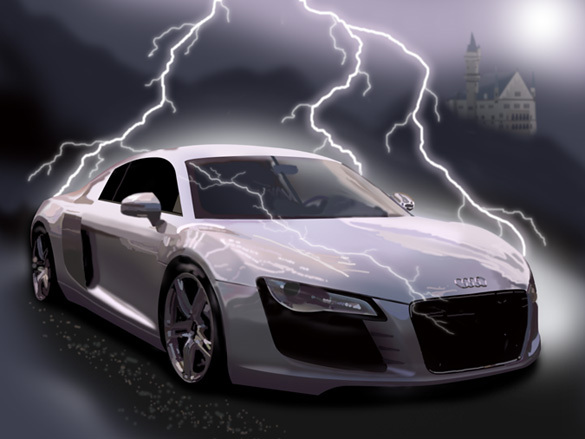 The site and the art in it is all about exciting automobiles from the classic era to the muscle car era and more recent vehicles. 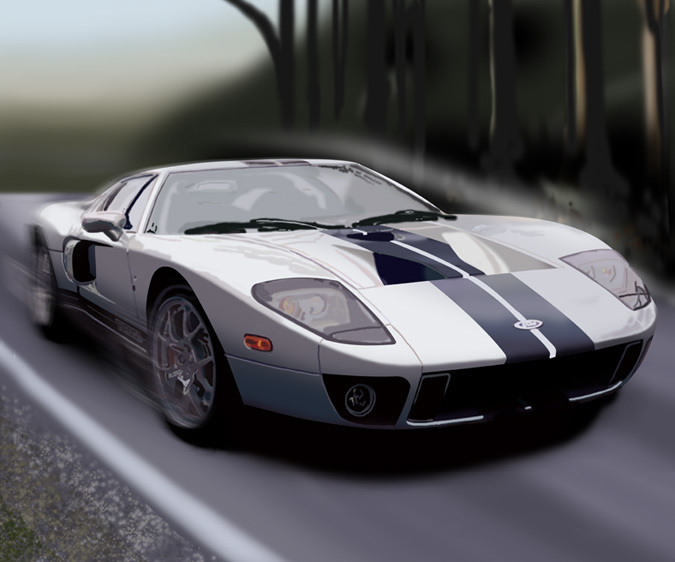 Included are paintings, digital artwork and car images of the following: 427 and 289 Cobra, GT350 and GT500 or Shelby Mustang, Daytona Coupe, Avanti, Mercedes Benz 300 SL Gullwing, 300 SL Convertible, Corvette, Sting Ray, Viper, PT Cruiser,Cord, Auburn and the fabulous GT40s Mk II and IV.Also included are the Apollo 11 spacecraft and North American P51 Mustang aircraft.New artwork will appear from time to time.I hope my paintings can bring back the joy and privilege of growing up in those times.The purpose of an artist is to paint the era and the moods most of us felt. Whether you are interested in design or automobiles I hope I offer something for everyone. Rick is gaining recognition for his outstanding work depicting Mustangs and Cobras and more recently the cars of Mercedes Benz which include both the 300SL Gullwing coupes and convertibles. His Mercedes 300SLR next to an F104 Starfighter will be shown after it has been scanned and digitized. In future the artist Rick Herron plans to include more classic and special interest automobiles and wll continue to accept commisions. He will continue with a series on Corvettes from 1953 to the present and hopes to include some fabulous show cars. He is also now accepting commissions from owners of the fabulous Loewy coupes and Avantis to include in his digital and acrylic collections. Car Art is probably the fastest growing category of art in the US. Enjoy your visit to the site of one of America's fine Automotive artists.